At Lulupu we have tradition of inviting winners of our challenges as Guest Designers. And today we have Catherine from Vidhu Creations. Let us know more about her! This is my first ever post as GDT. 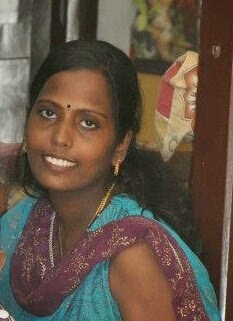 I am a stay at home mother of two cute lil princesses –A three yr old and a 4 month old with whom I enjoy life playing n dancing. I have been into paper crafting for the past two years. However, if I had to describe my style of Crafting, I&#039;d say I love it Simple. Paper crafting has not only provided me a feel of tranquillity, It gives me a great satisfaction when I see my thoughts come alive. I have the BEST Family in the world whom I love to be with. My husband is the best in the world. Besides supporting me in this endeavour, he gives me creative ideas and pays for it all as I began crafting with few Quilling strips and a needle. What was once contained in a box has now exploded into an entire room. 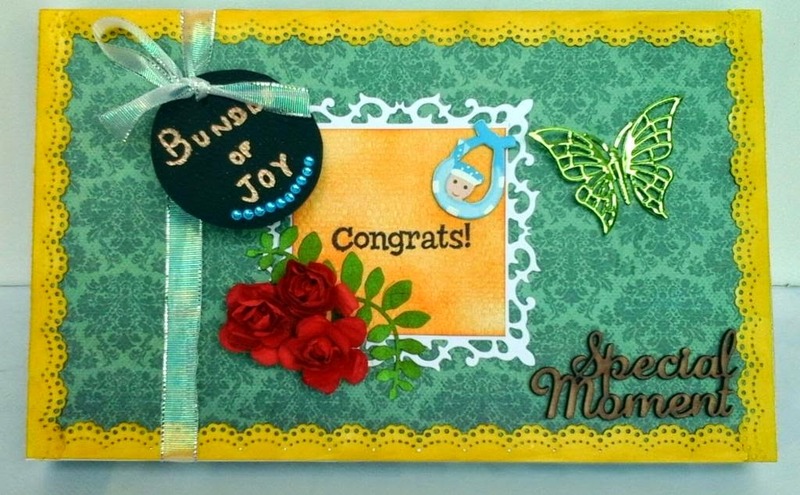 I was so excited when I saw my card as the winner at Lulupu Blog (Inspired by Lulupu logo challenge). 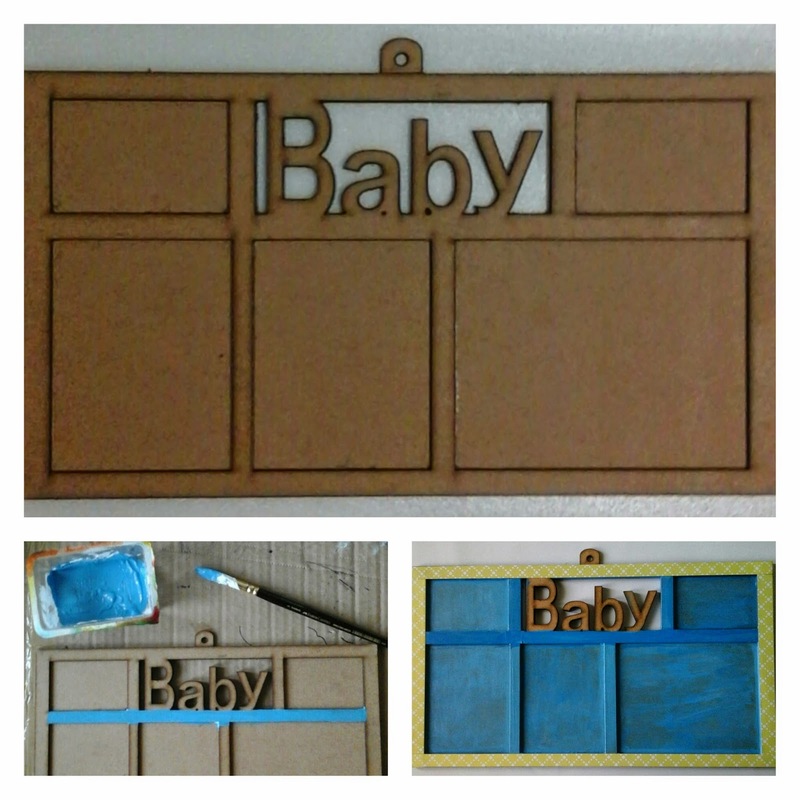 To play along with the latest challenge – Go 3D, I decided to make a MDF frame and a coordinating handmade box on New Baby Boy theme. And here are step by step..
1. 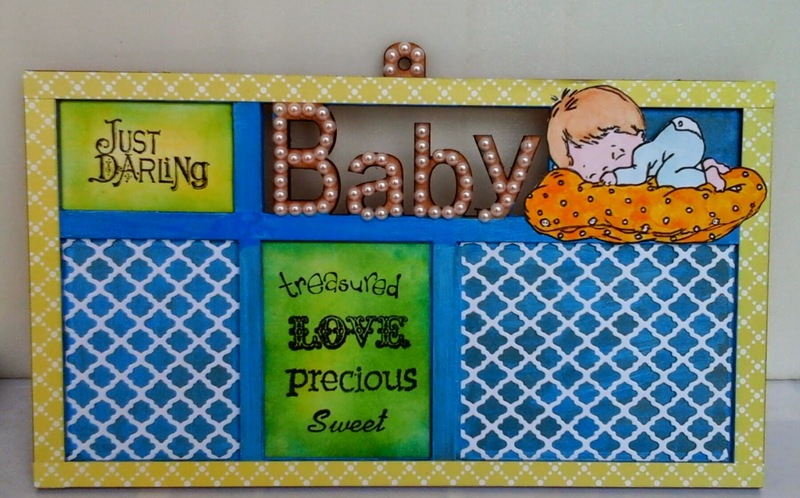 I have taken a Baby theme MDF frame. I like all my MDF items to be painted with acrylic or gesso before I start working on it. Here I painted the frame with blue acrylic paint. 2. For the Borders, I chose a lovely yellow pattern paper, cut them according to the measurements and glued them down with Mod Podge . 3. Just to highlight the theme, I decorated the header(BABY) with Pearls. 5. There are rooms for two photographs which I have filled with a lattice background. 6. Finally I sprayed a coat of acrylic spray to make it water resistant. 1. 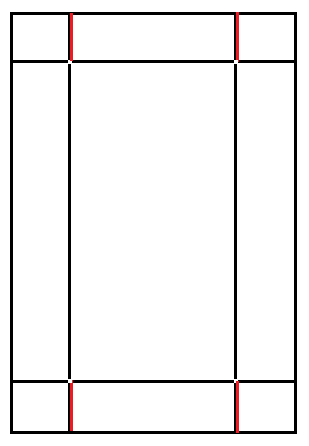 Take two pieces of heavy gsm cardstocks in white.2. Begin by measuring the size of the frame – the length, width and depth(including the projecting bits). I decided to leave a lil space around the frame when it is inside the box.3. Score the cardstock with the help of the score board. Then snip each corner on the red line. (Refer pic) This creates the glue tabs needed to assemble the box. 4. Fold the cardstock into a box shape. Be sure the glue tabs are on the inside. Glue the tabs to the sides of the box. 5. Create one more box following the same procedure a few centimetres bigger on all the sides so that it acts as a lid. 6. Now, decorate this with pattern papers. I have used punched cutouts as borders, added sentiment, flowers, and a Ribbon with a Black circle tag where the sentiment is heat embossed with Gold embossing powder. Hope you like my project!! That is awesome creation , isn't it? and be a Guest Designer at Lulupu blog!! Lovely MDF frame and box Catherine! !! Thanks for tute!!! Wow ! 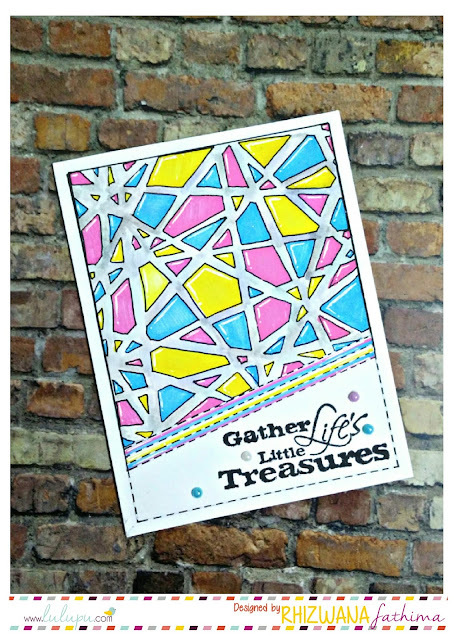 Beautiful Frame Catherine ! You have made a beautiful creation and I loved reading how your craft supplies which were in a box have now exploded into a whole room!! Ha Ha welcome to the club! Yes, Sonia, even I liked that part :). Your mdf creation is very beautiful Catherine:).